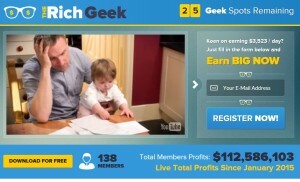 This review is a warning about a new binary options scam called The Rich Geek. A no name guy makes a video presentation in which he says that you can become multi-millionaire by using his trading system. And he is of course willing to give it to you for free. The Rich Geek is a very simple scam. You can see some indications like the counter for free spots. When you open the page, it is at 25 and counting down. But the real proof is in the testimonials. These are fake stories with photos bought from public sources. The same is valid for the testimonials in the video, they are made with paid actors. And the story with the Wall Street trader that gave this binary options trading system to the Rich Geek is a fairy tale. The reality is that whoever made this video is a binary options affiliate who will earn money for every new trader that he refers to his broker (Banc de Binary at this time). If you join the Rich Geek, you will first have to open a trading account and deposit at least $250. The trading system will then lose you all this money. End of story. 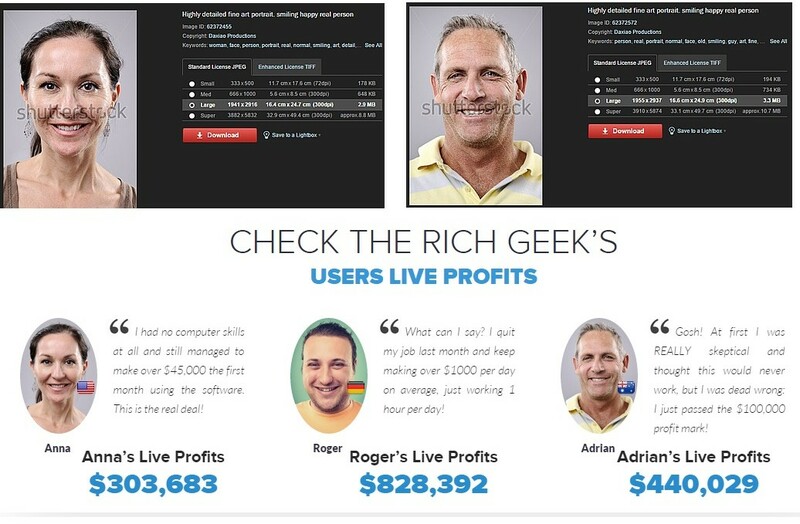 The Rich Geek is a scam abusing binary options. You can make money with binary options, but there are no automated trading systems that will make you money for free. You first have to learn trading and then trade your account with your own strategy, there is no other way.